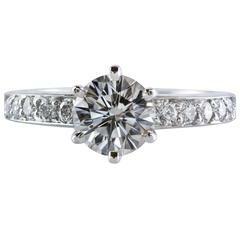 This ring features one round brilliant diamond of 1.01 carat I color and VVS2 clarity with certificate from GIA. 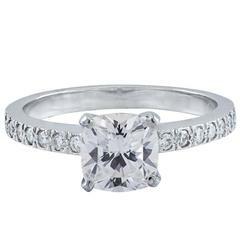 The diamond is Ideal Cut (Excellent characteristics in Cut, Polish & Symmetry). The diamond is accented by slightly graduated row of 5 round brilliant diamonds on either side, weighing 0.32 carats total. The ring set in platinum 950. The ring signed and numbered "Tiffany & Co ..90269". Please note that the signature and serial number are partially polished off (signature is almost all intact except for last letter "O" which is partially visible; in the serial number first 2 numbers are polished off). Please refer to the pictures for the signature condition. The ring comes with original Tiffany & Co box. Size is 3 3/4 US (resizable).